Man, I thought we were done with weeping angels. That guy in the New York graveyard isn’t the only dug-up body or person attacked and killed. Each of them used Ionic energy as their superpower source. SHIELD Forensics Agent Jenna Carlisle comes seeking Tony Stark and Iron Man’s help in finding the culprit. 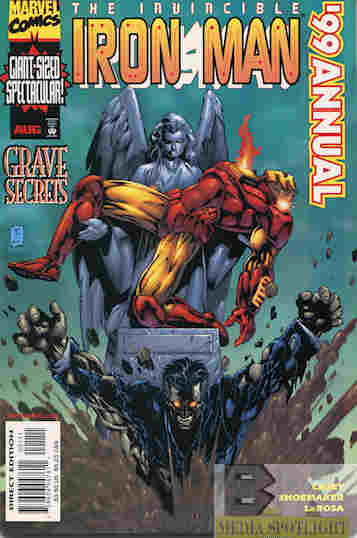 As Iron Man goes to warn various ionic-powered beings about the attacks he’s attacked by all the villains who were recently hired to kill Tony. All this eventually leads him to Sicily, where he and the Deathsquad fall into an ionic-powered trap set by Vittorio Silvani, seeing revenge on Stark and Iron Man for events in issue #81. (I don’t think I’ve read that issue.) But he’s only the puppet for Count Nefaria, who somehow survived and now must feed on ionic energy to survive like a vampire. Iron Man just manages to defeat him but his influence in Sicily allows him to not only escape justice but be granted immunity. Tony’s not worried as long as he doesn’t have ionic energy but Nefaria’s found himself a constant power source in some character named Therak. While Tony considered a romance with Carlisle, she’s too much of a danger junky and he’s had enough of those romances. What they got right: I’m not sure if ionic-powered people are unique to the Marvel universe, but it is an interesting exploration into people with those powers, although not enough about the power itself. I’ll come back to that in the next section. I think we’ve also finally learned who hired all the hits on Tony Stark (at least I hope so because it would be nice to finally put this subplot to rest). And the final battle between Iron Man and Nefaria is short but still quite good. I wish I had remembered it for Friday Night Fights back when we did that. What they got wrong: Like I said the exploration into ionic powers doesn’t go far enough. There’s an acknowledgment of various characters with those powers but it’s more of a clue to the mystery than really examining the power source. Recommendation: A rather enjoyable story. Worth checking out. Posted by ShadowWing Tronix on December 11, 2018 in Marvel Spotlight, Yesterday's Comics and tagged Count Nefaria, Iron Man, Jenna Carlisle, Marvel Comics, Marvel Universe, Shield, Tony Stark.